I hope this will find you enjoying good health as I am happy to say it leaves myself and young Jim. He is growing a fine little chap. All day long he is with me in the Office; he has a case to himself and he goes on composing away at the type in a way that would amuse you if you saw him. The weather at present is very hot here but nothing to what it is down country. I believe at Agra it is fearful. There are no hot winds and in the room with punkahs and tatties (see editors note below) going, it is 90 degrees; but we have it so pleasant at nights and morning, that it makes up for it. I have been very busy for a long time back, closing the year’s account which I have just finished. We have a series of soirees connected with the college every fortnight for the amusement of the soldiers in the station. They go off very well, and the drawing class room, where they are held, is crowded each night. I will send you a copy of each affair one night. There is a lecture and the next singing. I am printing two lectures that have been delivered. No news here. Everybody is away at the hills that can get away or just can afford it. I have just been asking little Jim if he has no word to send his Grandma, but he only laughs. He fancies you must be somebody particular. The mail is in, I believe, this morning; but no letter, as yet! Hope there will be one tomorrow. 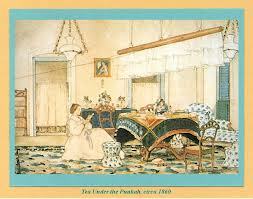 A punkah is a large swinging fan, fixed to the ceiling and pulled by an Indian servant called a punkahwallah. A tattie is a screen or mat made from the roots of the fragrant cuscus grass and placed in a frame which covers a window or door in order to cool and freshen a room. This entry was posted in 1863. Bookmark the permalink.